Observation - Bullfinches - UK and Ireland. Description: A single male bullfinch and then a group of bullfinches. Unfortunately the group were not in a position where I could get a convincing photograph but some of there features can be made out. As I moved around to try and get a better photo they flew away. 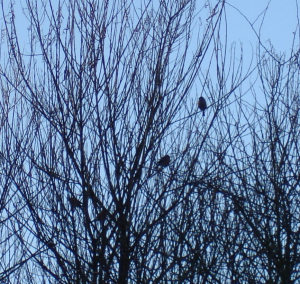 A single male bullfinch and then a group of bullfinches. Unfortunately the group were not in a position where I could get a convincing photograph but some of there features can be made out. As I moved around to try and get a better photo they flew away.